Getting to grips with a Beyblade isn’t so difficult, but there are some handy tutorials to go through when first starting Story mode. 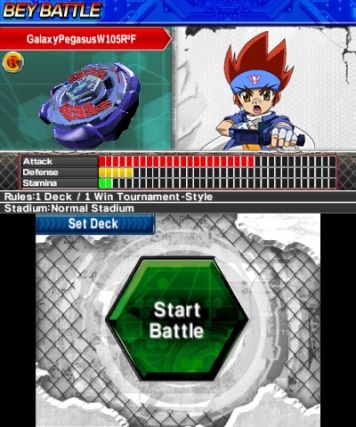 Using a Beyblade in a traditional battle basically, consists of first holding the 3DS handheld level – so the tilting mechanism works properly. Then the player is prompted to literally make a throwing motion at just the right time to gain the advantage. This action manages to successfully replicate that throw that characters from the anime do just before shouting the iconic “Let it rip” catchphrase. It’s a fantastic way to ensure that fans immediately get used to the idea of going through this process every time a new battle starts. 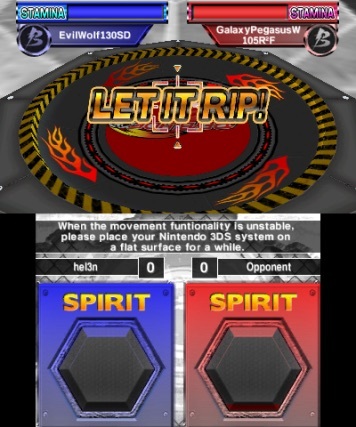 Unfortunately, there isn’t much else that the player controls during the battle itself, with both Beyblades fighting it out until one stops moving or is pushed off the stage. The only interactions players have during this phase is by throwing a spirit power (that builds up over course of battle) at the Beyblade. It literally makes the Beyblade go faster, but it’s necessary to use caution as it also works on the opponent’s Beyblade, if it gets hit by the spirit power instead. Yet again, throwing the Beyblade with the right timing at the start will ensure this spirit power fills up faster. Other ways of ensuring victory in a Beyblade match is making use of the various Beyblade types. These consist of traditional types such as defence and stamina. Each comes with its own strengths and weaknesses – power type works best when thrown at the edge of a stage. This makes up somewhat for the lack of proper interaction with the Beyblade during a match. Especially as it also ties in nicely with the concept of building Beyblades. Parts are available to purchase from a shop. These are then used to build various Beyblade types in the Bey Factory. There are so many parts to choose from and putting them together results in all kinds of Beyblades. StreetPass users can also trade Beyblade configurations with others who have the feature active, whilst fans of the anime will spend hours attempting to win enough BB points in battles to buy every part. One of the main attractions in Beyblade Evolution is the Story mode. Here players will face off against various other characters (presumably from the anime) in battles and mini-games. As already explained, battles consist of just one match. It does seem like matches end too quickly though. Perhaps due to how little control there is over Beyblades once they are thrown. Still, at least it manages to capture the essence of the anime – that thrill that comes from eagerly awaiting who comes out as the winner. Every once in a while there are tournaments where players can face more powerful opponents. There are some rather impressive prizes for the grand winner. Funnily enough, one of the best aspects of playing through Story mode is the mini-games. These are a welcome addition to what would have been basically just Beyblade match after match. There’s quite a lot of different mini-games to play too. Some of them even make use of unique 3DS features, such as augmented reality to aim Beyblades at floating balloons. There is even a mini-game that tests the knowledge of veteran Beyblade fans. It consists of identifying parts for each Beyblade. Each mini-game is a welcome break from the constant battles and it’s Beyblade: Evolution at its best. Oddly enough, it doesn’t feel like there is ever any proper story progression. Characters will either eagerly accept challenges or complain about being busy – yet still accepting to start a match if the player persists. The only real progression comes from the tournaments that appear every once in a while. Otherwise, it’s a shame that it never really feels like there is much to do in Story mode beyond taking on endless matches. At its best, the story is more like an excuse to have Beyblade matches (or mini-games) at every moment whilst playing this mode. Unsurprisingly, the other modes all consist of more Beyblade battles. There is Data Battle where data from other modes is used to create opponents for the player. There is also a mode that makes it possible for two players (local wireless) to see who is the best. The more interesting of the modes available, outside of Story mode, is Survival where the player attempts to win as many Beyblade matches in a row as humanely possible. Visually, Beyblade is not exactly the best looking 3DS game out there. Yet it’s understandable since the focus is on the matches and the stage. There are various stages to play in with their own props – such as one that is completely surrounded by a fence. The character models also stand out against the backdrops. It makes clever use of the different layers to make different parts of the screen stand out when playing with 3D effects on too. The Beyblade parts are given every detail that makes them easy for fans to recognise. It’s clear that the Beyblades is the focus here and that is great since that is what players will care about. As for the soundtrack, it contains lots of lively tracks that will remind fans of the anime. There isn’t a lot to listen to, but it’s still nice to hear some of the tracks whilst playing in different areas of the game. Beyblade Evolution isn’t going to impress just anyone. It’s one that is clearly more aimed at the fans who will enjoy every detail. They will revel at the chance of getting every part and building their own Beyblades. It works exceptionally well when playing matches. Yet, there is always the feeling that it has the potential for being even better – as seen whilst playing the rather fantastic mini-games. Still, Beyblade Evolution is a faithful representation of the Beyblade anime matches.